Paper artist Linda Stephen with “Pas de Deux” dancing origami cranes. 折り紙を用いた絵画、折り紙コラージュ、折り紙ワークショップ リンダ・ステファンは日本の伝統的な折り紙、押し絵、ちぎり絵に影響を受け、色彩、形のパターン、紙の質感、影を重要な要素として、上のどれとも異なった折り紙を使った作品を生み出しています。作品に使用される和紙は、友禅和紙、千代紙、もみ紙、雲竜紙、落水紙等と多彩で、これらを用いて奥行きのある風景画が生まれます。 リンダ・ステファンにとって、何の変哲もない一枚の紙から人生におけるありとあらゆる場面が生み出される折り紙は「希望」のメタファーであり、そこから生み出される作品は、人と人とをつなぐ希望の架け橋となっています。 リンダ・ステファンの折り紙アートはアメリカと日本の両国において公私にわたり広く所蔵されています。代表的なものでは、アメリカ合衆国のミシガン州ビッグラピッズ市にあるJW マリオットホテルの姉妹都市作品シリーズ（『ピアッツァ広場』『グリフィンの目から見たペルージャの丘』『マコーラの市場』『グリフィンの目から見たグランドラピッズ』）日本の滋賀県近江八幡市市長室の『八幡堀』等。 Linda Stephen has more than 25 years of experience in origami, the Japanese art of paper folding. Fluent in Japanese, Linda studied Japanese arts and worked for seven years as a teacher and translator in a castle town in rural Japan near Kyoto, Japan’s ancient capital. A native of Michigan, Linda spent much of her youth outdoors in all seasons. She has also traveled and worked extensively across North America, Asia and Europe. Her art celebrates special moments and beauty in our everyday lives. Linda began making origami bas relief art in 2003 while working in New York City. 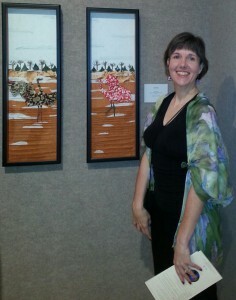 Since then, her paper collage landscapes have won national and regional art awards and have been featured in more than 100 juried exhibits across the country including the U.S. Botanic Garden in Washington, D.C., The Museum of the Hudson Highlands in New York, and the Museum of Nebraska Art in Kearney, Nebraska. She speaks on Japanese paper arts, origami (paper folding), and origami’s connection to math and engineering to audiences of all ages at museums, arts centers, schools, universities and nonprofits across the U.S. Her art is part of public and private collections around the world, from the Mayor’s Office in Omihachiman, Japan to the Minden Opera House in Minden, Nebraska. Her commissioned works range from animated TV commercials for “Tobacco Free Nebraska” to the JW Marriott Hotel’s sister city collection. A lifelong student of culture and language, Linda has worked as a writer for projects on five continents including United Nations’ agencies, international nonprofits, Fortune 500 companies, technology start-ups, and book publishers. After 9/11, when she was in New York, she left her corporate job to focus on inventing origami art that is a celebration of color and the moments that we have. She lives in Lincoln, Nebraska.